Stanley Spector Was The Most Controversial Drum Teacher of All Time. His Students Revered Him For it,Other Teachers Despised Him For it!.. Take A FREE Lesson With Stanley Today! Spector School Of Drumming - Whether you opt-in via this web page or by texting to us, we will send you an SMS message to confirm your signup. You will receive 1 msg/week. For all questions about the alert service provided by this short code, you can send an email to john@spectorschoolofdrumming.com. Kudos For Stanley From The Drumming Greats! 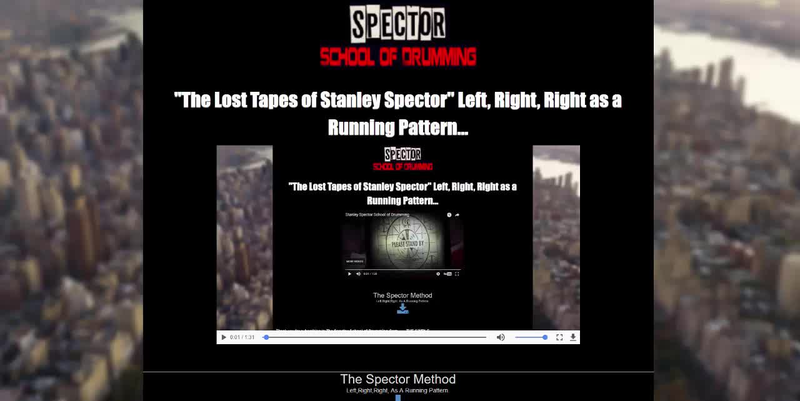 It’s about time someone came along in the drum teaching field like Stanley Spector. He has actually found a way of teaching Jazz drumming. There are specific reasons why he gets amazing results with his students. The method is backed up with solid thinking, experimentation, and considerable teaching experience. I find his original theories to be wonderfully stimulating.” Max Roach. “It’s useful to know how to read and have good technique. The problem with lessons is that most teachers don’t know how to get across the importance of time and feel, and kids get misled into thinking the lessons are a waste of time. It all depends on the teacher. I recently spent some time with a man named Stanley Spector, and he had a really good method of teaching. Some people don’t like his method because he doesn’t teach by rudiments, but the alternative he has to offer makes a lot of sense and it really works. The student should remember to take lessons and put them in perspective with his own opinions about playing.” Steve Smith. "There is no other teacher for me," he declared. "Many of them are so busy with the hands, building technique. Having 'good hands' has nothing to do with playing jazz. I am sure Buddy Rich and Joe Morello would still be as great if they didn't have 'good hands. You've got to do first things first learn to keep time and swing. The basic things a drummer is supposed to do, but you can't just do it right off the bat; it takes a while.“ Jake gives Stanley, with whom he studied for three years and has on and off since, all the credit for his background and for his proficiency...Jake Hanna..
Musical Talent Has A Way Of Reaching It's Own Level. So You Have To Ask Yourself, How Tall Do I Stand? © 2019 THE STANLEY SPECTOR SCHOOL OF DRUMMING is a Trademark of Maverick Musician LLC.